The pomegranate tree bears large, fleshy fruit that is packed with antioxidants and other nutrients. This unique plant offers several medicinal benefits. Pomegranate has been valued for its nutritional and medicinal benefits for thousands of years. The fruit, seeds, peel, bark, and leaves of the plant have been extensively used in the ancient Ayurveda system of medicine to treat a wide variety of health conditions, from diarrhea and intestinal worms to cardiovascular issues and hemorrhoids. Modern research has corroborated pomegranate's strong antioxidant activity, making it a popular "super fruit," with a number of medicinal applications. Treating gastrointestinal problems. Due to its antiseptic, anti-inflammatory, and astringent properties, pomegranate haven been traditionally used for alleviating diarrhea, dysentery, cholera, upset stomach, and hemorrhoids, as well as for eliminating intestinal parasites. Supporting cardiovascular health. Pomegranates have also been shown to help prevent and treat cardiovascular conditions, such as high blood pressure, high cholesterol, heart disease, and atherosclerosis. Additional medicinal uses of pomegranate include preventing an treating diabetes, as well as infections such as herpes simplex, flu, and gum disease. 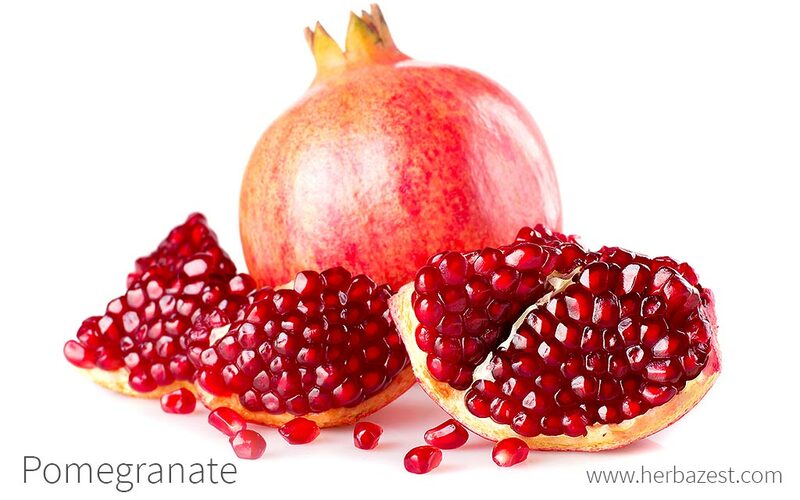 The two compounds largely responsible for pomegranate's antioxidant activity are ellagic acid and punicalagin. Flavonoids also play an important role in pomegranate's antioxidant activity because of their effect in eliminating free radicals. Pomegranate's strong antioxidant and antiseptic properties are due to the combined action of tannins, flavonoids, and alkaloids. Together, these compounds work to protect cells from oxidative damage. The tannins in pomegranate not only help stop diarrhea and alleviate hemorrhoids, but also also inhibit the replication of herpes simplex virus. Pelletierine alkaloids found in pomegranate bark are responsible for its antiseptic qualities. Antiseptic properties can be found in cardamom and eucalyptus, whereas olive and tomato boost cardiovascular health. Dietary consumption of pomegranate has been deemed generally safe. However, the fruit can cause allergic reactions in sensitive people. Symptoms include skin rash, hives, and bronchospasms. Pomegranate can negatively interact with certain medications, such as over-the-counter painkillers and anti-depressive drugs, reducing their pharmacological action and potentiating their side effects. Since pomegranate has the ability of lower blood pressure, people taking anti-hypertensive medication should avoid consuming this fruit in any form. Pomegranate is also a natural blood thinner, and those about to undergo surgical procedures should about its consumption, since it inhibits coagulation. It is recommended to seek medical advice before consuming pomegranate in medicinal doses. Pomegranate is known as a "super food" because of its nutrient-rich qualities. It is loaded with vitamins A, E, and C, all of which have antioxidant actions and work together to support cardiovascular health, as well as for improving iron absorption, which makes pomegranate fruit a great option to treat and prevent anemia. Pomegranate juice has been shown to contain more antioxidants than most fruit juices, red wine, or green tea. Due to their nutritional and medicinal benefits, pomegranate fruits are widely consumed in salads and desserts, as well as processed into jams, syrups, wine, and candies. However, its healing properties are more concentrated in remedial and supplemental forms. Raw. The antioxidant benefits of pomegranate can be obtained in its natural, fresh form. Juice. The popularity of pomegranate juice has spiked in recent years, since it has been shown to reduce free radicals in cells. Decoction. Boiling pomegranate rinds an leaves for few minutes will allow for a more concentrated form of the herb, which can be drank on daily basis to keep in check cholesterol levels and get rid of intestinal worms. Powder. The pomegrate fruit is dehydrated and processed into a fine powder that concentrates its medicinal benefits and can be added to beverages and smoothies. Syrup. This is a highly concentrated form that can be taken orally to control hypertension. Tincture. The crushed seeds of pomegrate, as well as its fresh juice can be added to an alcohol solution and be kept aside for few weeks until the properties of the herb have been extracted. Few drops of this tincture are diluted in water for medicinal effects. Oil. Extracted from the seeds, pomegranate oil is a potent antioxidant and anti-inflammatory agent. It is used externally to moisturize hair, skin, and nails, as well as for treating acne and eczema. Capsules. Softgel capsules are also available for medicinal use, and they offer the advantage of a convenient, daily doses, in order to manage blood pressure and weight. Raw pomegranate can be found at most grocery stores or at local farmers' markets. Pomegranate is popularly consumed in its original fruit form, or processed as juice. 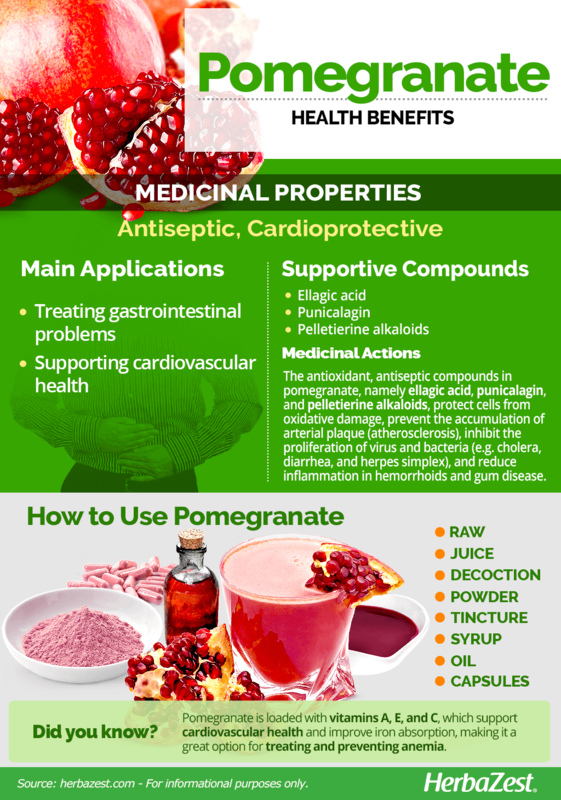 Pomegranate powder is commonly available at specialized health stores and can also be purchased from online retailers. It is also made into jams, syrups, wine, and candies. Pomegranate remedies, such as syrups ans tinctures, as well as supplemental forms, mainly capsules, can be found at most specialized health stores and are also available through online retailers. Pomegranate is a perennial plant that grows best in tropical and temperate climates with hot, dry summers and cool winters. Pomegranate prefers well-drained, sandy soil, with a neutral or slightly acidic pH. The plant needs plenty of sunlight, but moderated watering for best results. Because of its size and wide root systems, it is best to plant pomegranate in rows placed 22 feet (7 m) apart. They plant can withstand considerable drought, but for the best fruit yield, it is recommended to water it once a week. It is best to plant in early winter or late spring after the last frost. Pomegranates have similar shelf-lives as apples, so they are best stored at a temperature of 32 - 41°F (0 - 5°C) after harvest. Pomegranate is a deciduous shrub or tree that can grow up to 20 feet (6 m) in height. Pomegranate plants are characterized by their bright orange-red flowers and large, fleshy, red fruit. The fruit is encased in a leathery rind with a prominent calyx attached. Pomegranate, or Punica granatum, is a member of the Punicaceae family. Pomegranate is one of the only two species in its genus, Punica, which is the sole genus in the Punicaceae family. Despite its long history of cultivation and use, no distinct subspecies of Punica granatum have been identified by botanists. However, a "dwarf" variety (Punica granatum var. nana) exists, and it's used mainly as an ornamental plant or a bonsai specimen. In addition, approximately 500 cultivars exist worldwide. It is thought that pharaoh Tuthmosis introduced pomegranate from Asia to Egypt as early as 1500 BCE. Pomegranates also played a role in Greek mythology: they were called the "fruit of the dead," referring to the story of Hades tricking Persephone into eating its seeds in order to keep her as his wife. Aside from its nutritional and medicinal healing properties, the pomegranate rind was also supposedly used by the Ancient Romans as a leather substitute. However, its medicinal uses were forgotten after the fall of the Roman Empire, and it wasn't until the 19th century that herbalists began using pomegranate to get rid of tapeworms again, and it became recognized as a popular remedy. Pomegranates have been a popular fruit ever since their discovery, but their popularity has spiked recently due to their high antioxidant content and other nutritional value. The leaders in pomegranate production and cultivation are the United States, specifically California, followed by Turkey. In California, an estimated 20,500 tons of pomegranate fruit are produced each year. Gardening. Some pomegranate cultivars have ornamental value, particularly the dwarf varieties. Personal care. Pomegranate oil is also used in the cosmetic industry, in creams, massage oils, masques, and toners.